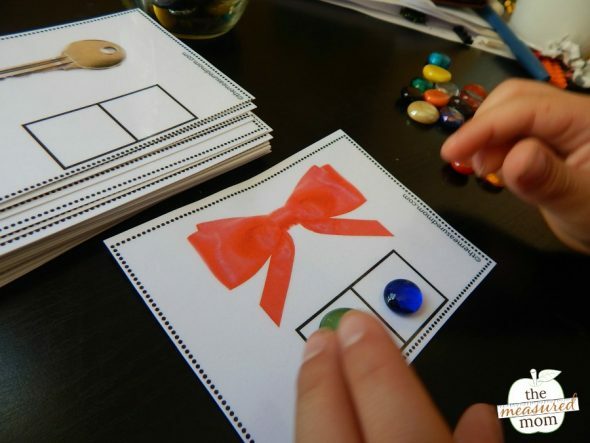 Elkonin boxes are a wonderful tool to help kids learn phonological awareness! Have you heard of Elkonin boxes? 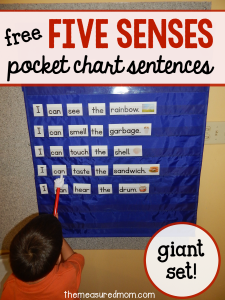 These simple tools help kids build phonological awareness by helping them divide words into their individual phonemes. phonological awareness – the ability to hear differences in the ways words sound. 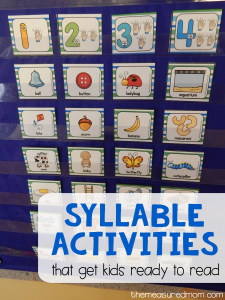 If children have phonological awareness, they can identify beginning sounds, count syllables, and rhyme. phonemes – the individual sounds within a word. For example, “rake” has four letters but only three sounds – /r/,/ā/,/k/. 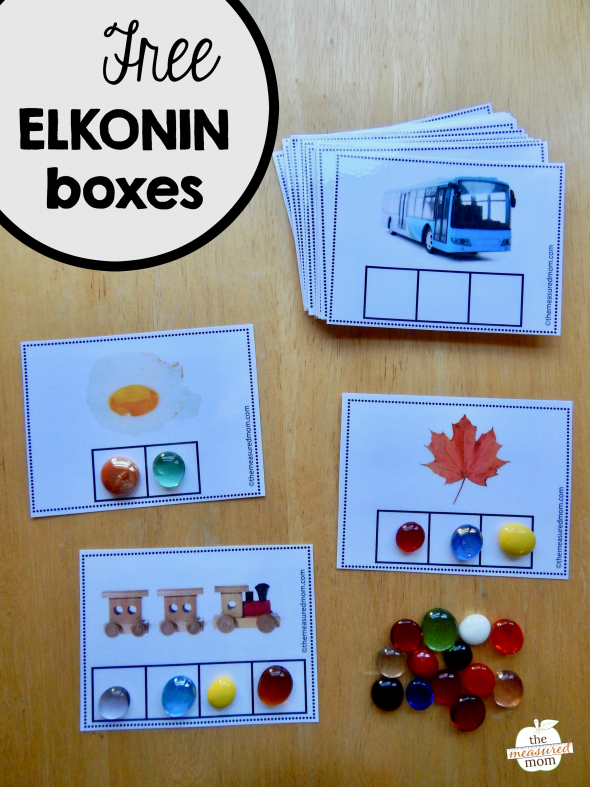 Elkonin boxes help kids hear phonemes. 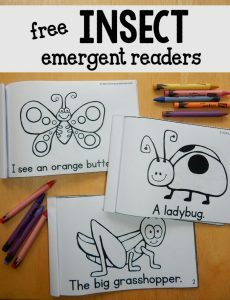 They’re a fantastic way to develop an important pre-reading skill. Print and cut apart the Elkonin boxes. (Laminate for durability if desired.) 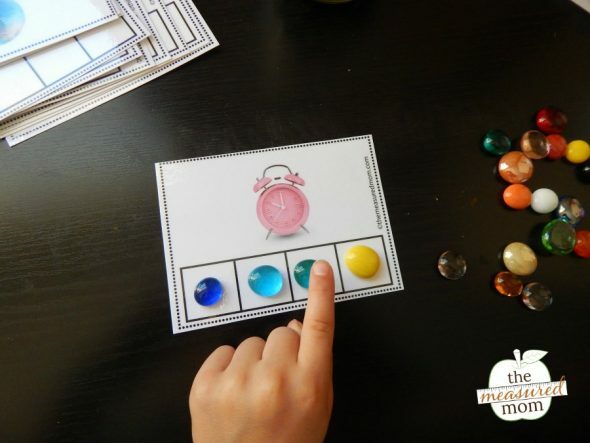 Then grab small manipulatives that are fun to use. We used these colorful glass gems. Place a card in front of your child. Start with a simple one that has only two boxes. Continue the activity with the other words that have just two phonemes. /b/ /ō/. 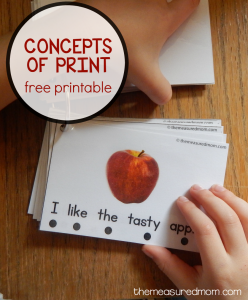 I pulled these cards out for my Four, who knows his letters very well (thanks to our letter of the week activities), understands concept of word (because of our work with voice to print cards), and is even starting to read simple sight word books. These were hard for him! It surprised me. He wasn’t able to isolate the sounds in each word, but he was willing to watch me do the activity and point to each sound as I named it. We’ll do the activity that way for now, and I think that one day soon he’ll be ready to try it himself. Name the picture and a particular sound. 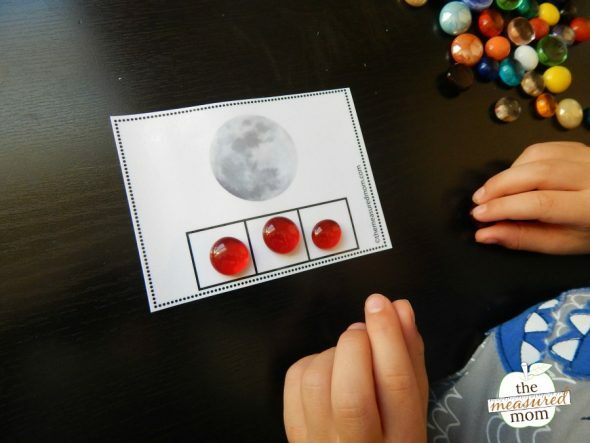 For example, say the word “moon” and tell your child to show where he’d mark the sound “/n/”. He should put a gem in the last box on the card. Grab your free cards below! P.S. The download contains cards with images AND with clip art (in both color and black and white). Make sure you mark the pages you want to print so you don’t waste ink. P.P.S. A reader asked for an answer key. You’ll find it in the download. 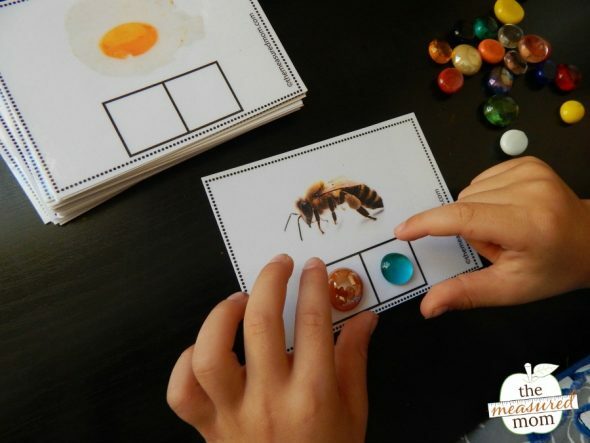 Looking for more activities to develop pre-reading skills? Nursery rhymes are full of possibilities! I just wanted to thank you. We were talking about Elkonin boxes in our PLCs the other week and I wanted to add them to my guided reading. I’m so excited to try these with my kiddos! AND, I have your nursery rhyme packet – my kids LOVE it! Even my little boy who doesn’t speak English is enjoying the rhymes and learning new words. My kids are picking up so many important pre-reading skills! Thank you for all you do. I love that, Karen – perfect timing!! I’m so glad you got these in time to use them, and I’m THRILLED to hear that your students like my nursery rhyme pack! Thank you Anna for sharing. I am a new subscriber, I feel at home already with your great ideas and the worm welcoming newsletter. I think your site will help me to assist some of my students that are strugling with their phnonological awareness and beginning reading skills. Continue the great work! I love it all. Can you please give the answers of all the elkonin box ? what are the phonemes of the following words? shoe ice fox egg web ant apple leaf snail vase deer glue chin globe toast broom lamp train dress truck bread. Thank you for this, yes I know all about elkonin boxes from my Dyslexia Action training. Teaching English in France to young children, is exciting and this will be very useful. Yay – so glad you can use these, Lynn! I can use the Elkonin boxes for myself, too! As a non-native speaker, it seems very funny to use! And useful of course! These are awesome. I just started using these with my 4 year old who was struggling with breaking down words by sound. First I laid out some of 2 and 3 sound cards and I said words one sound at a time and because she was able to see the pictures it clicked. She loves to do these. I will also use them for my 6 year old so she can write in the letters for spelling practice. I love all of your resources! We are also using your Weather Packet and it’s great. Thank you, all the way from Phokeng, South Africa, for your wonderful free resources. They are so engaging and just what I need! I’m so glad to hear that, Rachel! Thanks a lot, your resources are a great help and of course interesting. Great work!! Continue sharing, thank you. Thank you for the encouragement, Nusrat! Thank you for the great work done in the field of early years. My teachers are so excited with a substantial addition to their resource bank. This caters to the differentiation in our classroom. I’m so glad you can use this resource! I love all your resources as you know. However I was wandering, do you break up the consonant blends? such a gl bl etc. bl can be counted as one sound. Consonant blends are two separate sounds. However, digraphs (sh, ch, th) are each a single sound. very nice but we don’t talk Englisch at school. You’re very welcome, Ral! I’m glad you like them! I love using these with my students. Thanks so much! Remember, x has two sounds /k/ and /s/ so it needs two boxes. I am trying to download the free elkonin boxes by signing up but the site will not let me. If you could help out that would be great! I have been trying to get the elkonin boxes but I guess the link is not working. I have put my email address down over and over again but still cannot get it. Would or could you please email them to me. I love all your resources and am excited to start using these boxes. This is Kate, Anna’s assistant. Once you enter your email address, the file is sent to you immediately. If you haven’t checked your email, please go check it. Once you open the email, you will click on a blue link that says something like, “CLAIM YOUR OFFER.” Enjoy your elkonin boxes! Love your resources!! Just letting you know that there is an error with one of the items on the segmenting phonemes task. Fox has 4 phonemes, not 3. Fox – /f/, /o/, /k/, /s/. /x/ is not a phoneme. Yes, thanks! I’m not sure how I missed that. For now I recommend that people don’t use that card, as I don’t know when I’ll be able to make the edit.